The perfect skiing getaway or summertime adventure base camp for the whole family in Lutsen, MN. Blue House is a large, private home nestled against Lutsen Mountains ski runs visible behind the house. Blue House has three bedrooms, 3.5 bathrooms, and two spacious open living areas. Enjoy sweeping 180 degree views of Lake Superior and Lutsen Mountains. At Blue House you get the privacy of a single-family home while still being close to everything the Ski Hill area has to offer- including ski-in/ski-out access to the mountain must ski the trees. The open layout living area has floor to ceiling windows allowing for plenty of natural light and Lake Superior views. Luxury furnishings and tasteful decor add to the appeal of this beautiful home. Enjoy family time in the living room area. The living room also features a wood fireplace. Firewood is included There is room for everyone in this spacious mountaintop home. There is seating for 8 at the dining room table. The spacious kitchen island is a dream for many. With seating for four it`s a great spot to enjoy breakfast. Enjoy stainless steel appliances, including a dishwasher, as well as granite countertops in this gorgeous kitchen. There`s also a ping pong table and a football table. Enjoy watching Netflix on the smart TV while a fire burns in the wood burning fireplace. The master bedroom, located on the top level of this home, has sweeping views of Lake Superior, a private balcony, and a TV with DVD player. The master bedroom has a queen bed and an attached full bathroom. Master Bedroom has access to a balcony. The private balcony has these incredible Lake Superior views. The attached master bathroom has a soaker tub you can enjoy after a long day on the slopes. The second master bedroom, known as the King Master, has a king sized bed and a private balcony with mountain views. The attached bathroom to the King Master has a shower/tub combo. NOTE: The third bedroom now has two twin beds and one queen bed- perfect for kids or a family. Queen bed in lower bedroom and closet with plenty of space for you to unpack The guest bathroom is located between the game room and third bedroom and has a walk-in shower. The den, located off of the kitchen, has a sleeper sofa and desk- perfect for overflow guests and those needing to work during their stay. There is a half bath near the home`s entrance. Coming for a longer stay No need to overpack- as this home has a dream laundry room The laundry room has a folding table and plenty of space for folding laundry. Enjoy two balconies, a lake-facing deck, and a 3-season screened in gazebo, all allow you to take advantage of the Lake Superior views. The multi-level deck is great for enjoy the Lake SUperior views. In addition to the private balconies and the lake facing deck there is a 3-season screened in gazebo and gas grill. Enjoy the outdoors without the bugs in the screened in gazebo and take in the beautiful views of Lake Superior. Blue 2 is a small additional space located behind the main house. Bright and cheery Blue 2 is the perfect overflow space for large groups. The bed folds down into a queen sized bed for additional sleeping out in Blue 2. Blue House was originally built for a family who grew up here in Lutsen. Purchased and renovated in 2017, it is now available to rent year round for families and friends who love the North Shore. From a premium chef's kitchen to the large open game room, this home has it all! 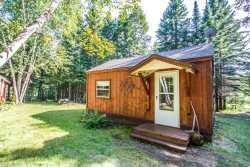 Located just off Ski Hill Road and walking distance to Lutsen Mountains Ski Resort. The Blue House is a year-round destination, perfect for your family's next trip to Lake Superior's North Shore. home. Each area of the home allows for both privacy or groups of people to gather. The timber frame game room is separate from the living room. There are 3 bedrooms plus an office with a West Elm pull out queen sized bed. The kitchen is equipped with everything you need to make meals; the dining room table seats 12. Almost every room has a view of Lake Superior. A free bag of locally roasted Fika Coffee is provided for your stay. There is a coffee grinder and a DeLonghi espresso machine for your use. The addition of Blue 2 means there's even more room to roam on this large property. Blue 2 features a sitting area where the sofa turns into a queen sized bed, TV, heat, and air conditioning so it can be used year round. Superior. And that’s just the beginning. Enjoy the vibrant nightlife at Papa Charlie's and Mogul's restaurants with live music year round. During the summer months, you have easy access to the Alpine Slide, sight-seeing gondola, and miles and miles of hiking trails. Should you get the urge to venture out from the immediate area, you will find you are a short drive away from many North Shore destinations. Lutsen Resort, with two restaurants and a spa, is just a mile down Ski Hill Road. Within a 20 mile drive, you will find waterfalls, scenic overlooks, historical markers, and the quaint town of Lutsen. Just 30 miles away is Grand Marais, great for a day of shopping and dining in wonderful ma and pa stores and restaurants. The North Shore has a lot to offer and The Blue House is right in the middle of the action. So whether you are coming up for a ski trip with friends, or a summertime vacation with the whole family, the Blue House is a destination to consider. This home is our premium luxury home so we ask that you treat it well while taking time to appreciate the magnificent mountain-top views of Lake Superior. NOTE: The hot tub is not available to renters for insurance reasons. NOTE: Please be aware of sleeping arrangements for more than 10 guests. Sleeping arrangements for guests 11 and 12 is in the Blue 2 Guest Cottage that has moderate to difficult access in the winter months and easy acces in the summer months. There is no bathroom in Blue 2. *There is no bathroom in the Blue 2 Guest Cottage- guests will need to use the main house bathrooms while staying in Blue 2. A walkway to Blue 2 is shoveled in the winter but does require a walk to get to that may be a moderate to difficult walk depending on snow conditions. Summertime access is easy. Wonderful Christmas in Lutsen 2018 , really enjoyed our stay at the Blue house. Skied for 5 days. Ate almost all of our meals in, so used kitchen extensively. Enjoyed the real wood fireplace. Finished our evenings with a movie in the game room. Would definitely stay here again! We LOVED the Blue House. The location was superb, the views were amazing. The space was great. Plenty of room for the kids to play in the "game room" and adults to gather by the fire and kitchen to visit. We will definitely stay again and would highly recommend this rental for families and get togethers. Con: it is advertised as ski in/ski out, although it is possible, it is very difficult to do so on the ungroomed trail. All of us that attempted to "ski in" got stuck and we could not find the "ski out" trail.